Boeing B747-412SCALE 1/200. IRON MAIDEN WILL BE TOURING 35 COUNTRIES IN "THE BOOK OF SOULS WORLD TOUR 2016" 747-400 JUMBO JET. "Iron Maiden" Colors. With Rolling Gears and Stand. 1:250 Scale. Display Stand Included. Boeing B747-400SCALE 1/200. Good Luck to All. Boeing B747-400SCALE 1/200. Limited Production. Item Number: SKR508. Skymarks Delta Boeing 747-400. Aircraft Type:Boeing 747-400. Airline: Delta. Durable Plastic Material. Not intended for children under 14. Adult Collectable Model. Trending at C $49.46eBay determines this price through a machine-learned model of the product's sale prices within the last 90 days. BRITISH AIRWAYS. 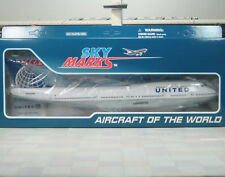 Boeing B747-436SCALE 1/200. Item Number: SKR304. Skymarks British Airways Boeing 747-400 W/Gear. Airline: British Airways. Aircraft Type:Boeing 747-400. Durable Plastic Material. Not intended for children under 14. Adult Collectable Model. Boeing B747-4H6BDSFSCALE 1/200. "2007s" Colors. With "Cargo" titles. With Gears and Stand. With Spinning Engine Fan. Exclusive to World Cargo. WORLDAIRWAYS CARGO. Skymarks Virgin Atlantic Airways (UK) Boeing 747-400. Adult Collectable Model Not intended for children under 14. Simple Snap-Fit Design. Durable Plastic Material. New in the box. Item Number: SKR488. Skymarks El Al 747-400. Airline: El Al. Durable Plastic Material. Not intended for children under 14. Adult Collectable Model. New in the box.